Georges de La Tour (French, 1593–1652). The Magdalen with the Smoking Flame, ca. 1635–37. Oil on canvas. Los Angeles County Museum of Art: Gift of The Ahmanson Foundation, M.77.73. 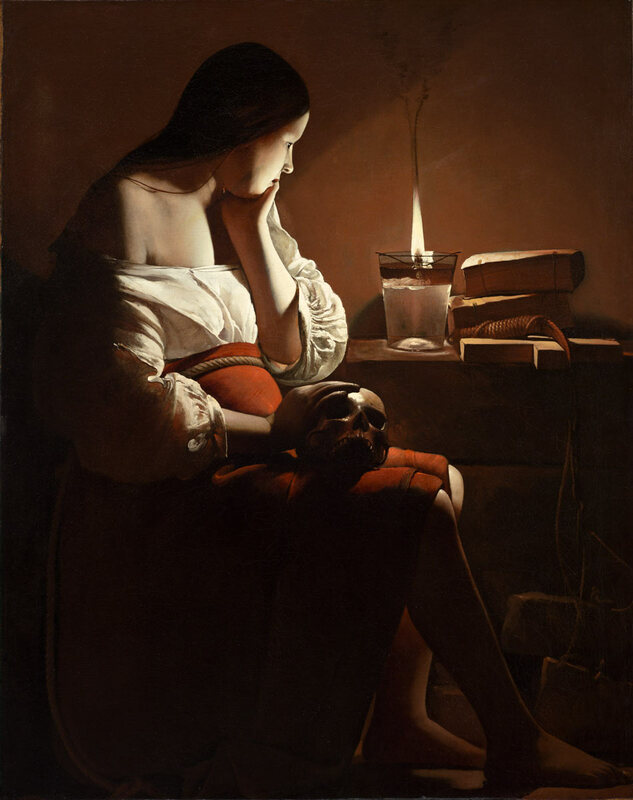 The Portland Art Museum is pleased to present Georges de La Tour’s painting The Magdalen with the Smoking Flame (circa 1635–37), a treasure of the Los Angeles County Museum of Art. The exhibition is the sixth installment of the Museum’s ongoing Masterworks | Portland series, which focuses on individual works of outstanding quality by great artists not represented in the Museum’s collection. Georges de La Tour (French, 1593-1652) was one of the great painters of light. He mostly specialized in nighttime scenes in which artificial light sources play an active role. These were certainly not new in European art, but La Tour was exceptional for the way he used light to establish mood and to convey the essential qualities of the subject. Typically, the light illuminates only the essential details, and the geometry of his austere compositions endows them with monumentality. Mary Magdalen—the leading woman among the first followers of Jesus—was the paradigm of the sinner reformed by a life of solitary contemplation and penance. Thus, La Tour’s work very appropriately captures her lost in transcendent state. The mood of concentrated meditation is heightened by the distinct aura of light and especially by the darkened lower part of the composition. Other than the wafting smoke, the scene is profoundly still and quiet. Focus on an object is a basic principle of meditation, and here the Magdalen is absorbed by the flame of an oil lamp. In this context, it principally symbolizes the light of divine truth in reference to Jesus’ declaration: “I am the light of the world; he that follows me shall not walk in darkness, but shall have the light of life.” (John 8:12). Thus, in La Tour’s painting, the light becomes a naturalistic manifestation of the divine. La Tour expressed Mary Magdalen’s contemplative state in a striking way. Everyone knows the entrancing quality of flames, and the artist used this to make the Magdalen’s absorption poignant and real to viewers. He skillfully manipulates the light as a foil to the enveloping darkness, not only as an evocation of Jesus’ words, but to draw the spectator into the Magdalen’s state of mind. The Magdalen with the Smoking Flame is sure to spark reflection and emotion during its stay in Portland. Do not miss this opportunity for close looking and in-depth understanding of one of the great Old Master paintings in America. Curated by Dawson Carr, Ph.D., The Janet and Richard Geary Curator of European Art.